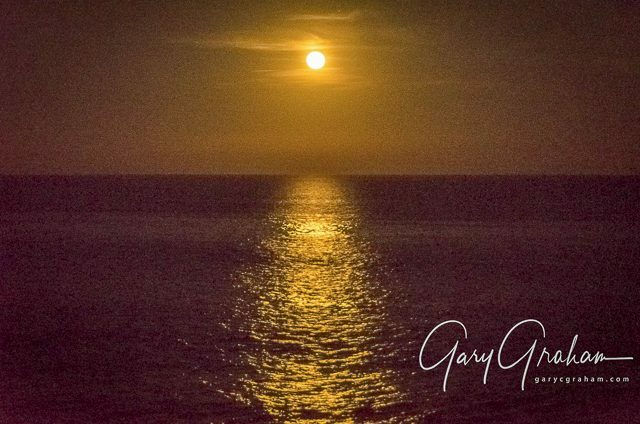 Discussion in 'Baja Bytes By Gary Graham' started by Baja Bytes, Jul 3, 2018. Whatta’ week for striped marlin! Completely dispelling the “full moon theory” that fish don’t bite when it’s present, the Stars and Stripes Charity tournamentheld in Cabo San Lucas last weekend tallied over 121 billfish in its newly implemented Tag and Release Division sponsored in part by “Gray Tag Research.” The top three teams each racked up double-digit tag and releases in the two-day event. Pretty awesome for Baja stripers! https://ss18.catchstat.com/. Congratulations to ALL the teams participating in this event that raised $3.6 million over four days for kid’s charities on both sides of the border. 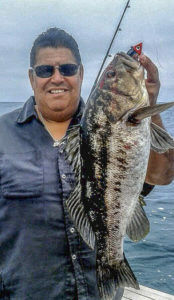 The headline story for this area would be the big bonito weighing up to nearly 10-pounds, although the sand bass action to the south in the Imperial Beach area was pretty good, too. The bonito are out on the 270, the 32 and outside of the NW Corner from 3 to 5 miles off the beach. The boats are finding them by trolling small feathers and getting jig stops as well as by finding spots of “breezers” and “foamers” that look just like bluefin, only smaller. Once located, they really want the anchovy! They will, however, also bite the sardine and just about any small chrome jig that is 85 to 100 grams. Colt Snipers are deadly! Down to the south, the sand bass bite in the Imperial Beach Flat/Pipe is pretty good and we got word the barracuda bite on slow-trolled sardines out in front of the Imperial Beach Pier worked well, too. For close to a month now, the yellowtail fishing at the Islands has been excellent. Even with a ton of boats around, the bite keeps rolling along. Lately, the weather side of North Island from Pukey to the Key Hole, and the lee side out to the Middle Grounds have been excellent choices of locations, but there are also lots of yellows down the lee side of the South through the Ribbon Kelp and the Bull Kelp and then from the lighthouse through the Five Minute Kelp, South Kelp and on to the SKR. Then back up the weather side of South Island to the Middle Islands Genoa Kelp and the Gun Site, most of the yellows are in the 6- to 8-pound class. There are schools of better 12- to 18-pound fish around as well, mostly at North Island, plus they are also scattered all around the Islands. Sardines are by far the top bait. Fly-lining or slow-trolling them is working great! Some guys are doing well trolling Rapalas, too. And like fishing the surface iron, well, that is also working. Barracuda and some bonito are around and the best place to find them is around the Ribbon Kelp and the lee of South Island down to South Kelp. The area around Coronado Canyon/425 is now the primary zone where the boats are finding lots of bluefin, mostly small-grade stuff in the 25- to 35-pound class with a few fish weighing up to about 80 pounds. Mixed in with these bluefin are a small, but growing, number of yellowfin tuna. The yellowfin are in the 15- to 25-pound class although there was one 50- to 60-pounder caught. Went fishing with Tito and it has been a long time since I fished with him so that was especially nice. 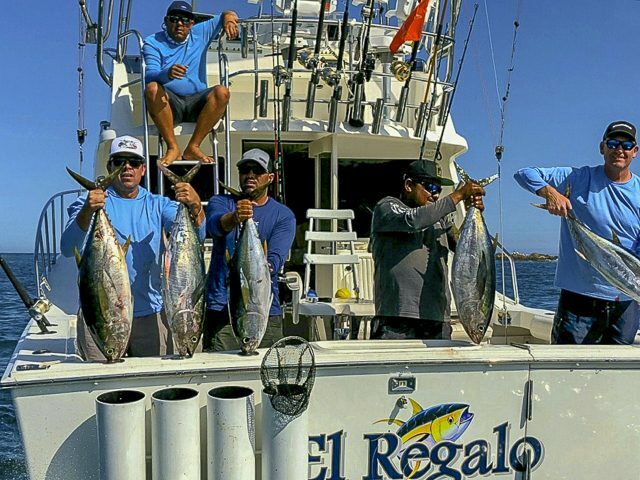 Yellowtail fishing slowed a little last week. Fish were scattered around the high spots on the South End and were not as eager to bite. Calico bass fishing is keeping everyone entertained right now during the slow yellowtail fishing. Dorado fishing/fish catching has gotten a little closer to town with most boats working around Coronado Island. The fish are still the early spring versions which won’t be full-grown until September. That’s okay; the 8-pound dodos will melt in your mouth just the same! Lots of sargasso near shore and it is thicker than I’ve seen it in 8 years; there’s also hordes of sardina which have been non-attending for almost as long. Both point to a good summer season for more than just dorado. The billfish and big dorado are reportedly out in the deeper water on the far side of Catalana Island. That’s a long haul from Loreto and in the direction of Mazatlán! Lots of gas so not many boats are working in that zone. Greetings! Well, today we found dorado heaven and I had one of the best fishing experiences of my life! My boat partner and I (truthfully) landed over 100 dorado ranging from about 25 to 32-pounds on cast flies. The morning started out slow on flat seas — smooth as glass. You couldn’t tell where the ocean met the sky. We hooked a marlin and lost it, but then our guide spotted a big patch of sargasso and on approach we saw this gargantuan school of hungry dorado that attacked our flies with a vengeance and kept us busy for a good two hours. After that, we did some trolling because the fish were starting to get jaded, and we caught about 20 more. I was pleased that my Belly Dancer pattern worked well in that situation and the jaded fish still liked the sardina imitations. We were the only boat in that location and we found out others that went in different directions also did well, but their take was about half of ours (still terrific by any standard!). With the summer solstice now past us, we could say the best fishing season is now in full swing. 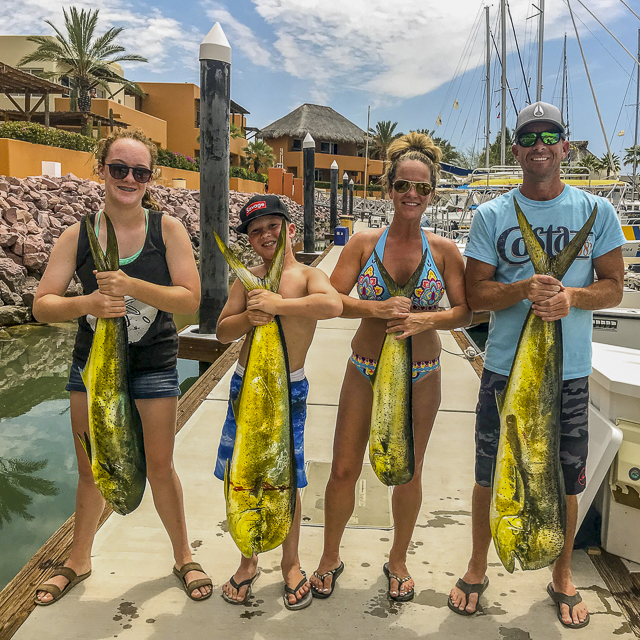 Despite the upwellings, the tuna never left, and very-good-size dorado are being hooked daily on live bait near the shore which is a big improvement from the years before. Wahoo are also starting to show up at the seamounts and we have managed to land some nice ones while spearfishing. The action was once again hot for marlin and tuna this week on the East Cape. Marlin were found within as close as one mile off Rancho Leonero south to the lighthouse. Trolled ballyhoo was more effective than lures, and trolled live bait was also very effective once marlin were located. Tuna were on the chew inshore and offshore. Bigger models came from inshore grounds but they were picky eaters. Tuna in greater numbers were found outside on schools of porpoise and were more willing to eat; bigger tuna were taken on live bait. Water temps in the 76-degree range. The water has been stirred up and off color with moderate swells. Bait supplies have consisted of caballito, mullet and some sardina. On the fishing grounds there have been sporadic baitfish schooling. Some days there are plenty to be found and some days not as much. Anglers using yo-yo jigs have found fishing for red snapper (huachinango) from good to excellent. yellow snapper, pompano, and bonito along with a few amberjack. 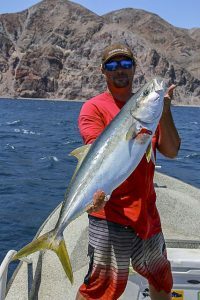 Along the shore, roosterfish and jack crevalle have been the most common fish caught with a few late season sierra in the mix. 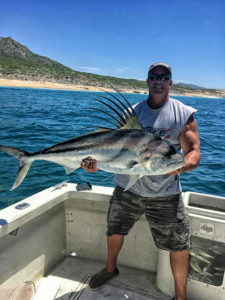 The majority of roosterfish found were in the 10- to 20-pound class, though farther north near San Luis where the water clarity was better, a few fish up to 40 to 50-pounds were found. Still there has been no action for dogtooth snapper; this is the time of year where these brutes are seen patrolling the inshore rocky reefs and we are hoping for a late season flurry of these largest of all snapper. The striped marlin action is continuing outside of Iman and towards Desteladera. Even though some days are better than others, there isn’t a large concentration of marlin. Trolling lures, bait, and casting to tailing fish or drift-fishing bait down deeper have all produced marlin strikes. Numbers at a glance: Billfish 65%, tuna 20%, dorado 3%, other species 9%. Recent tournament anglers found extraordinary double-digit releases for striped marlin along with an occasional sailfish. 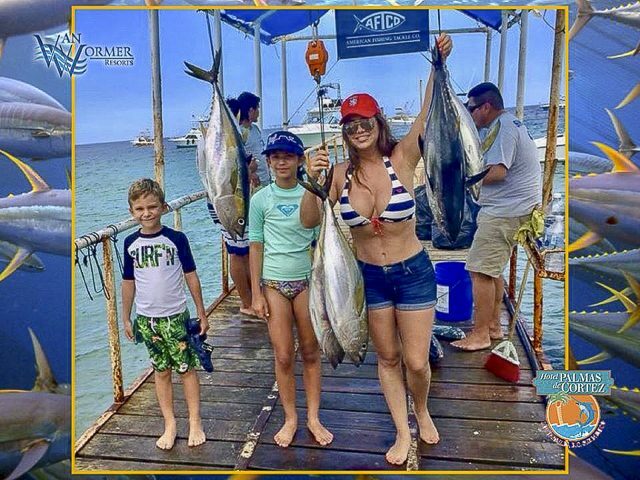 There have also been plenty of smaller yellowfin tuna on the banks both on the Pacific side and up into the Sea of Cortez. Unfortunately, most of the tuna were smaller fish with only a few reaching the 40-pound class size. Inshore, bucket list sized roosterfish were also a popular choice along with some of the tough-fighting jack crevalle that topped 30-pounds. There were a few wahoo and dorado taken as well, which rounded out the surface action. 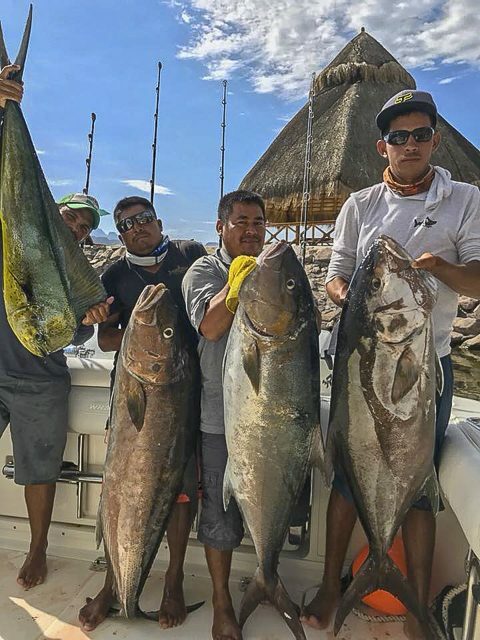 Pinnacles off the lighthouse at Cabo Falso were holding grouper, cabrilla and red snapper large enough to feed the family plus additional friends when prepared at one of the local restaurants surrounding the marina. LOCATION: Destiladeras, 20 miles out from the Old Lighthouse, Punta Gorda. WEATHER CONDITIONS: Mostly sunny, 80 degrees, and light winds. AVERAGE WATER TEMP: Water temps to 76°F. BEST LURES: Cedar plugs and marlin lures as well as live caballito, sardina, and mackerel. Is there any chance you could start including La Salina/Ensenada info in your excellent reports? GREAT REPORT and pics, lots of nice fish coming aboard now! Looks like awhile before I can fish still, Deltoid still healing, geez.